As immortalized in Vincent Van Gogh’s most famous painting, the vibrant sunflower is truly one of nature’s most intriguing creations as it follows the sun wherever it goes. Now, jewelry designer Anna Kang has created this eye-catching ring in Sterling Silver, lavishly plated in 14K Gold, and featuring a sunflower centered with a Black Diamond surrounded by topaz toned Swarovski® crystals. 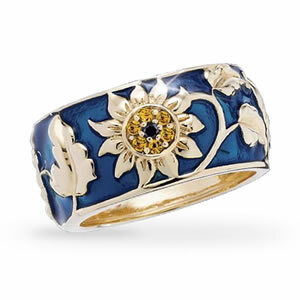 The beauty of the golden sunflower is further enhanced with a Royal Blue Enameled background. Wear this very special ring to brighten up your day.